Can anyone tell me the brand or anything about this wallpaper? We need to replace a wall of it, and the previous homeowners (who have passed away) put it up. We just love it and need to order more! It will be a long shot if there isn't any wall paper information laying around. 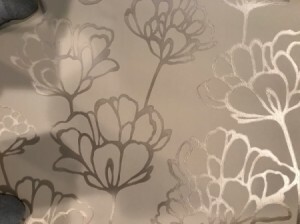 Any left over wall paper anywhere in the home? The wall paper looks to be metallic? If you know the flower name, I would type on google like Metallic Wallpaper Flower, and it'll be a lot of browsing to look through though. I wonder if you can bring it into a wallpaper specialist to see if they have an idea. I brought it to a wallpaper store but they had no idea. Thank you for such a wonderful response. It DOES seems it's a lotus flower so that is s big step in the right direction! I would take this picture (or a scrap, if you have one) to an established wallpaper store. A knowledgeable employees may recognize it. It is a huge challenge to identify old papers. There have just been so many and many that are similar by different companies. One person I know had to give up and just kept the paper one wall in a room a (they had some damage to the paper on other walls) and ended up stripping the damaged walls and painting in a coordinating color. It looks lovely and actually looks like they planned it that way. Another gal went mix and match with a similar paper...you have to look really close to know the walls don't match...the wallpaper shop helped her find something really close and it looks good. 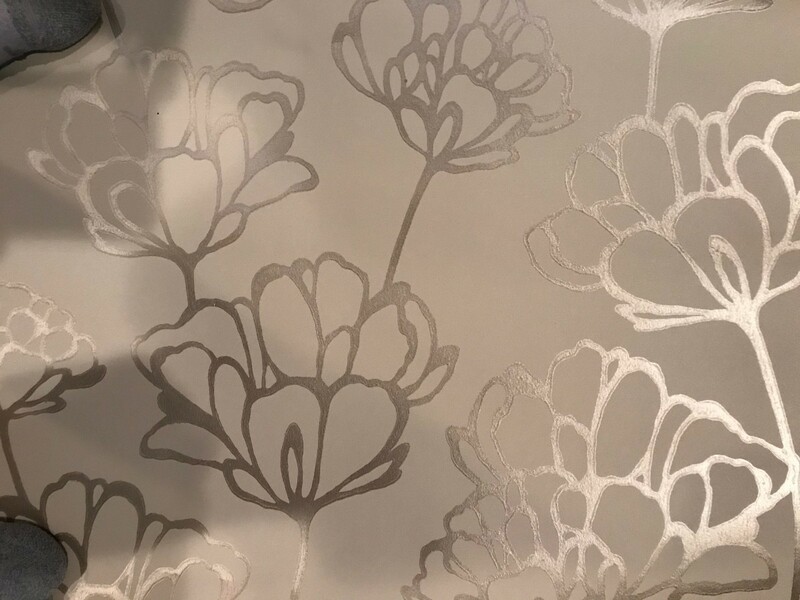 I like Pghgirl's suggestions and this may be how you will have to proceed as finding a vintage wallpaper WITH a name or/and brand is very difficult so it may be a very, very long shot to finding even a brand or name for this one. I'm assuming you also have no idea when (year) it might have been put up - maybe when the house was new? Even a year may be a beginning. A very long shot might be to look up wallpaper brands; find their offices on the Internet and send a photo to each asking if this happens to be one of their vintage wallpapers. Sorry but this is all that I can think of at this time.